The city of Cleveland, Ohio, is full of aging roadways in need of replacement. The old roads are surrounded by trees, fire hydrants and street signs. Paving conditions are tight, to say the least. Perk Company, based out of Cleveland, is one of the contractors working on rehabilitating those streets. 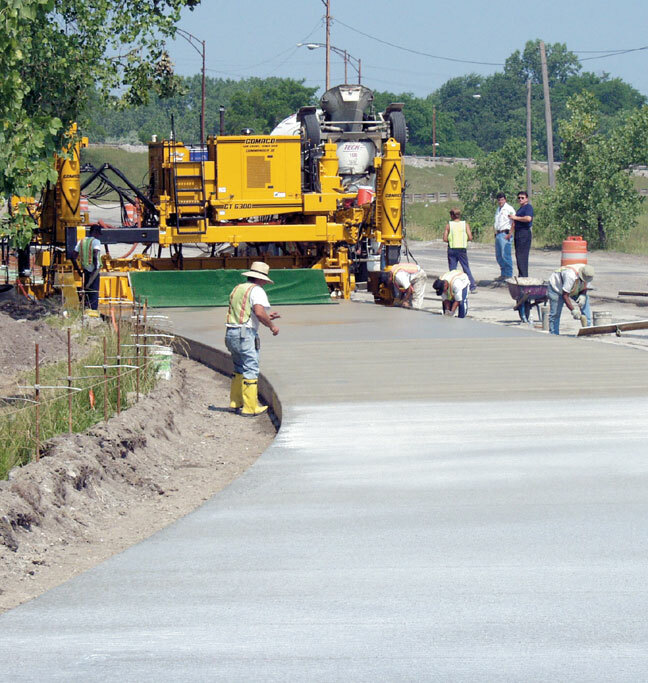 They needed a slipform paver that could handle the tight clearance conditions and produce a quality roadway. They turned to GOMACO and the Commander III four-track paver with a special high-drive track mounted on the back, left side of the paver. "These streets are old in Cleveland," Joe Cifani, vice president of Perk Company, said. "There's not much of a market right now for new work. Everything is in the older neighborhoods and those are all rehabs. When you're dealing with that type of work in a city, there's just not enough room. We needed a machine that could track as close as possible to those obstacles and give us the ability to do zero-clearance work." Perk Company put their new paver to work on a freeway rehabilitation project that includes the removal and replacement of the existing entrance and exit ramps. "This is our Commander III's maiden voyage and everything is working out really well," Cifani said. The first pass for the new roadway was slipformed 17 feet (5.18 m) wide and the reinforced pavement was 12 inches (305 mm) thick. 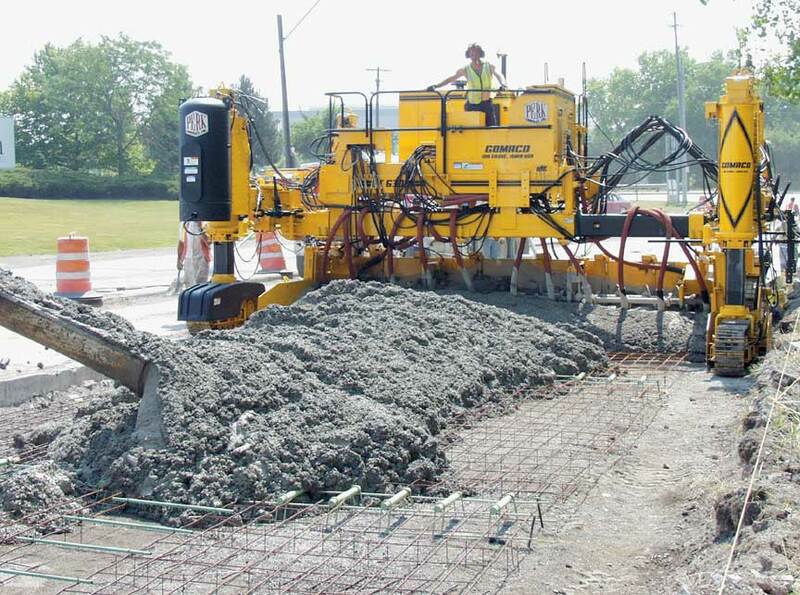 The concrete was an Ohio Department of Transportation Class-C mix design with 4000 psi (30 MPa). Average slump was two inches (51 mm). "This is an easy machine to set up, the controls are all in good locations and I like the way it pours," Matt Rediger, operator, said. "It's got a good feel to it. I'm used to running a two-track GP-2600 paver. I was a little concerned about how much mud the four-track machine would be able to push compared to our two-track. I'm impressed with the four-track. It's pushing quite a bit of mud and it's doing its job." An AstroTurf® drag is applied behind the paver and a white curing compound is hand sprayed on the finished slab. "The high-drive track is going to save us a lot of time and finishing work," Rediger said. "Telephone poles and fire hydrants won't be in the way with that high-drive track. We'll be able to go by them instead of pulling up, going around them, backing up again and having a spot where our guys will have to finish by hand. Now we'll just blast right through them." 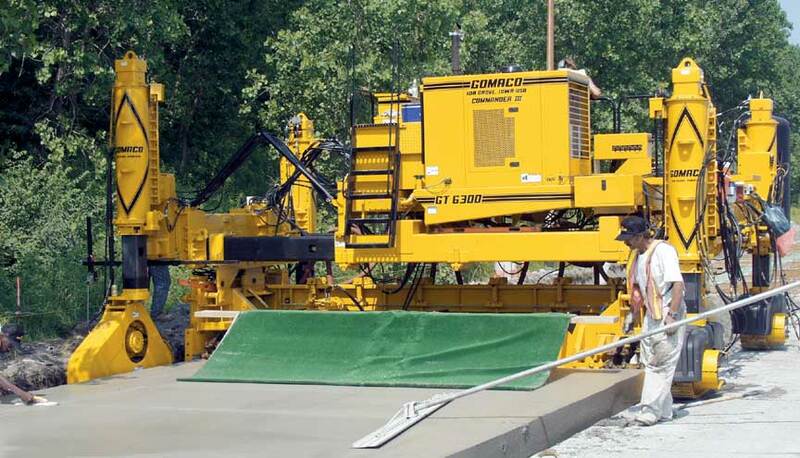 Perk Company currently has an inventory of six GOMACO machines ranging from a GP-2600 paver, to the Commander III and the Commander II. "My guys still fight over our Commander II. It's the best little workhorse we have," Cifani said. Perk Company prides itself on its versatility and the variety of projects they can successfully complete because of their GOMACO equipment. "A lot of guys will tell you that one color is as good as another in construction equipment, that brand doesn't matter," Cifani explained. "The GOMACO name matters. Every major player in Cleveland has GOMACO right now. They don't have them just because they like the color, they have them because they work. We've had real good luck with GOMACO products and we're happy with the support we get... it matters."